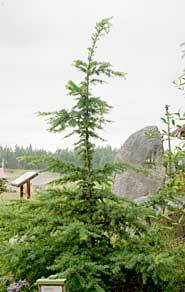 Evergreen tree to 150′ (grows 30′ in 20 years). 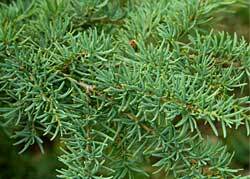 Short, flat, blunt, bluish-green needles irregularly spaced but equal in length and densely covering branches on all sides. 1-2″ bluish pollen cones and brownish purple seed cones. Found in bogs and wet sites and deep snowpacks. Native to western states and B.C.